It seemed fitting for Valentine’s day to roast some artichokes since it is their tender hearts we desire, and in addition their heart shaped bodies are always interesting to look at. So I buried these in the ashes and embers of the fireplace and 30 minutes later out they came; dusty, yet colorful beneath their armored leaves; pinks and greens and even some iridescent blue, but so faint I had to look hard to see that it was really there, and then they gave off an earthy aroma all their own. And our hearts, too, are still moving away from the unsettling events of earlier in the week, yet the small, nagging vacancies, where memories hold their power over us, can still pull us off center, but it diminishes more every day. 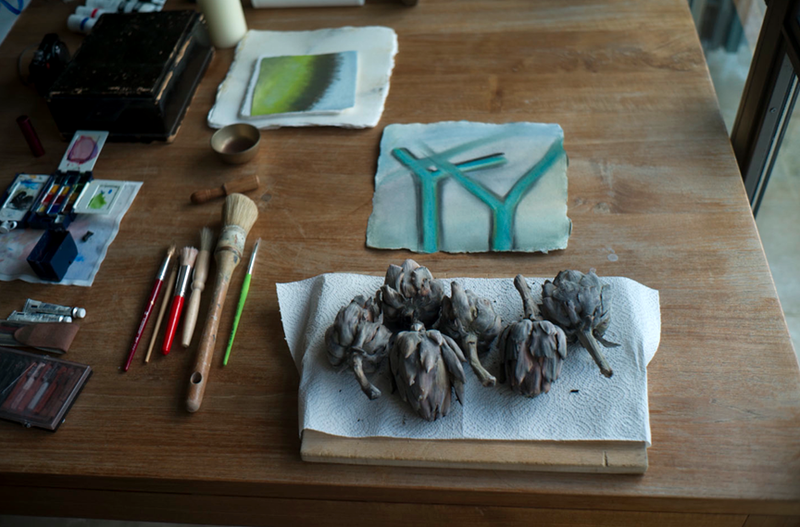 Maggie was outside drawing, and came in with this pair of trees which she left on her work table and when I saw them together with my artichoke trees this record of the table seemed to be the photograph of the day. A humble still life made from whatever is there and without arrangement is often a clue to the hidden beauty in things. I like ‘chance discoveries’ which, like photography itself, comes from unexpected moments in which we find ourselves suddenly awakened to the possibility that something fresh is calling out to be looked at. This entry was posted in Still Life on February 14, 2015 by joelmeyerowitz2014.